Adopting industry guidance, standards and certification, can lead to several things. Worldwide it can allow organisations to mitigate the risk of litigation, by providing some defence from an investigation, prosecution or fine and it can improve the quality, health and safety, sustainability and quality of construction process and outputs. In some areas compliance is required by law. Nonetheless construction and building services compliance is a complex field, wherever a project is situated. For example, in the UK, there are legal requirements with regards to waste management (including Site Waste Management Plans Regulations 2008) and health and safety (including Health and Safety at Work Act 1974). These are summarised here, highlighting the key challenges encountered to achieve compliance. Also presented, is the developing role digital solutions can play in enabling streamlined certification processes as well as meeting efficiency targets. Intuitive mobile solutions, deployable by professionals in the field, and are now readily available on tablets or smartphones today. Construction businesses need to fully and easily understand what is needed to assess and control risks and to comply with prevailing health and safety law, standards and guidance. The aim is for their occupational health and safety management to meet international ISO 45001 or other national regulations. Organisations can transform their health and safety processes by taking steps to reduce risk, meet occupational health and safety requirements, certification criteria and standards through digital innovation, including by using mobile solutions, such as the electronic Site Diary webapp. Health and safety related site data and information can be updated in real-time direct from a construction site. Discover in our article how you can find a solution for efficient construction health and safety management to reduce risk and meet your efficiency needs. Organisations in the construction sector also need to fully and easily understand what is needed to assess and control risks and to comply with prevailing environmental law, standards and guidance. For this they may seek to ensure their environmental management meets international ISO 14000 or other national regulations. Companies can take steps to improve sustainability and meet environmental management requirements, certification criteria and standards through digital innovation. This can be achieved by using paperless solutions, such as BatiScript and Site Diary, for sustainable product/assembly/system, installation monitoring/inspection. These can even be used for the close out and delivery of the environmental compliance management process itself. USING These intuitive solutions, environmental compliance task management can even be performed and updated in real-time and signed off direct from a construction site. Read another of our articles understand how you can achieve efficient environmental management in construction. Construction businesses need to fully and easily understand what is needed to assess and control risks and to comply with prevailing quality management regulations, standards and guidance. The aim is for their quality management to meet international ISO 9001 or other national regulations. Businesses can take steps to refine their quality management operations, improve quality, meet requirements, certification criteria and standards through digital innovation, including by using mobile solutions, such as BatiScript, on tablets and smartphones for collaborative defect management. Quality related site data and information can then be updated in real-time direct from a construction site. Through a further article by us realise how you can overcome the barriers to efficient construction quality management in construction. Are you looking for a software developer who clearly understands the seriousness and complexity of occupational health and safety, environmental management and quality management needs within the construction and building services industry? One that seeks to develop proprietary and bespoke business improvement solutions with cloud-based storage capability with software and applications that assist clients and users meet their compliance requirements easily? Solutions that allow you to navigate, integrate and synchronise all the necessary data and information relating to and between these interconnected HSEQ fields seamlessly and – critically – avoids time-consuming and thus unproductive data re-entry and unnecessary duplication? 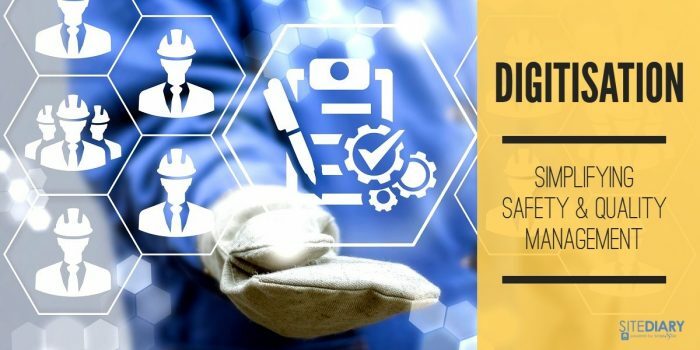 Contact the Script&Go team to discuss how its BatiScript and Site Diary solutions can assist you in meeting your digital HSEQ assessment and compliance needs today.